We’ve had some glorious weather here in the UK, sunny and warm and perfect for pottering in the garden and despite my sewing commitments I couldn’t resist some time outside preparing the raised beds for this year’s planting. The beds are in pretty good shape, the boards, in places, are coming away from their posts (they are 5 years old now) although the wood itself is still sound. In most cases all I had to do was remove some weeds and rake over the tops, we do still suffer quite badly from weeds in general in the garden but when you consider it’s 25 year neglect before it became ours and my sometimes erratic gardening time I think it’s to be expected. There are less each year and I am finally getting on top of the brambles and creeping buttercup that weave their way around the paths and appear in every nook and crevice. 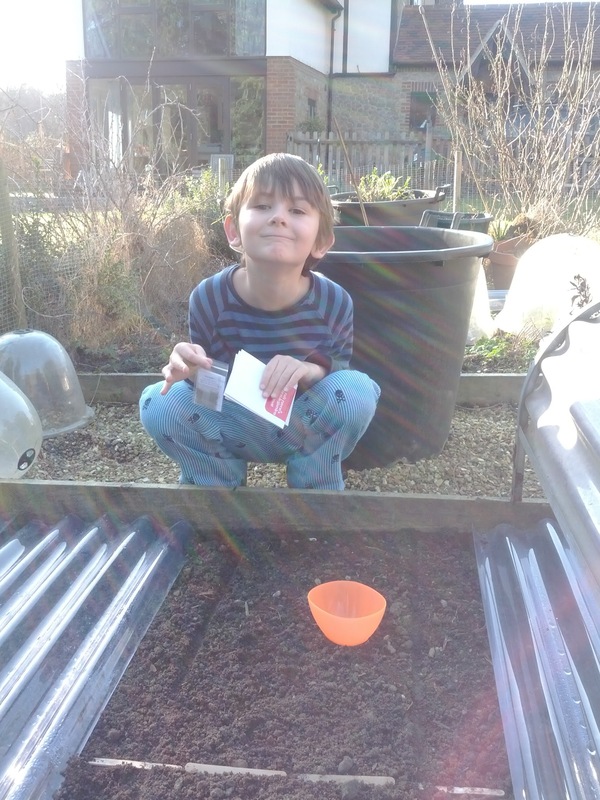 I have mentioned before that I’ve given the boys a bed to share this year so we kicked off the planting outside here. I might have liked to wait a few more weeks, this warm spell could well turn cold, but they can’t wait, apparently. both the red and purple variety are new for us but the boys were very keen on the idea of red carrots. They’ve also put a row of spring onions ‘North Holland Blood Red’ and radish (a mix of ‘Sparkler’, ‘Cherry Bell’and ‘French Breakfast’) on either side of the carrots. I plan to remove the cloche and replace it with an old cloche frame covered in enviromesh when the weather warms up to keep the carrot root fly off, last year’s planting in large pots worked really well as apparently they can’t fly above about 60cm/2ft and the buckets are much higher than that, but I think I’ll be keeping these for growing squash crops this year. 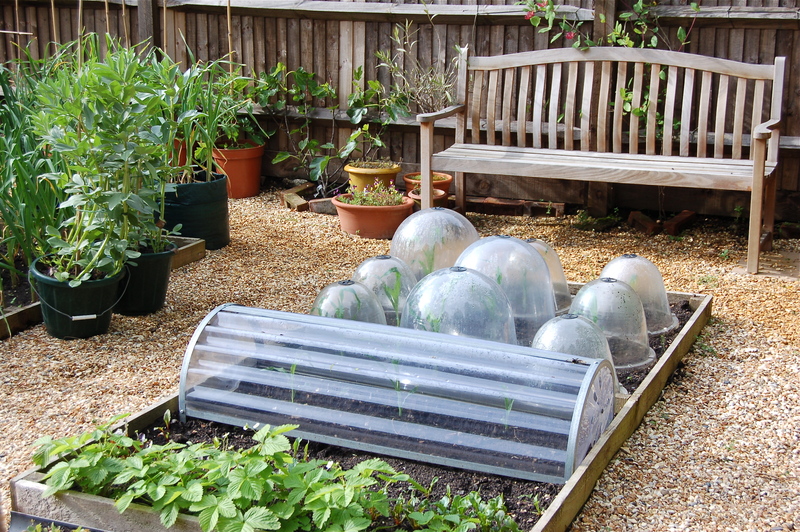 Whilst on the subject of cloches I bought another 2 of the Haxnicks versions (available in many on-line shops), as above (the photo is from a few years ago), once made up they have proved to be the best in the garden……the problem is making them up. I imagine if there are two of you it’s fine but if it’s just me and two little boys (M is away working at the mo) it’s the kind of job that can make a grown women cry. I very nearly did. They arrive in ‘flat pack’ form and need to be assembled, the plastic arrives rolled, in fact it has such a tight roll that prising it open to get it into the narrow groove of the metal on the sides (where you have to screw firmly into place) is incredibly difficult, the slightest movement and it springs out and curls back up, attempting to remove your arm in the process. 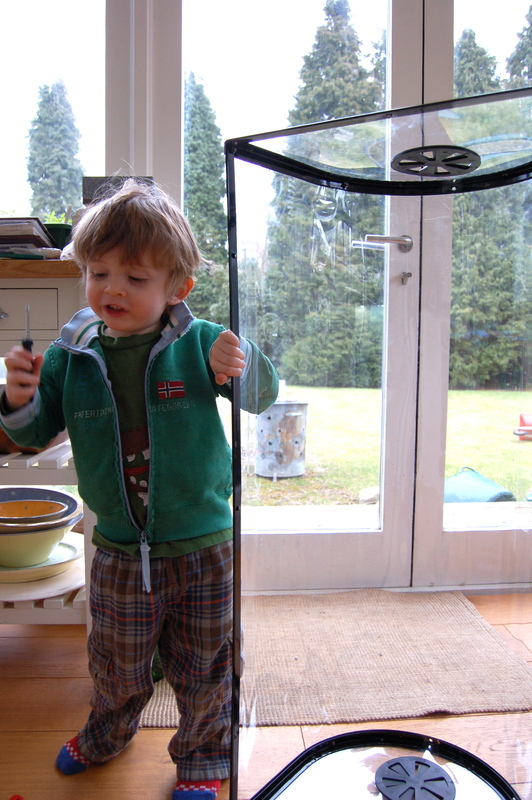 It didn’t help that the boys abandoned me two minutes in when I shouted rather urgently – can you pass me the screwdriver please boys….the screwdriver….yes, the thing with the black handle….JUST PASS IT PLEASE…PUT THE PLAYMOBIL DOWN AND QUICKLY PASS THE SCREWDRIVER!!! – at which point they ignored me and went to watch cbeebies, wise move, and my hand was nearly ripped off by curling plastic. 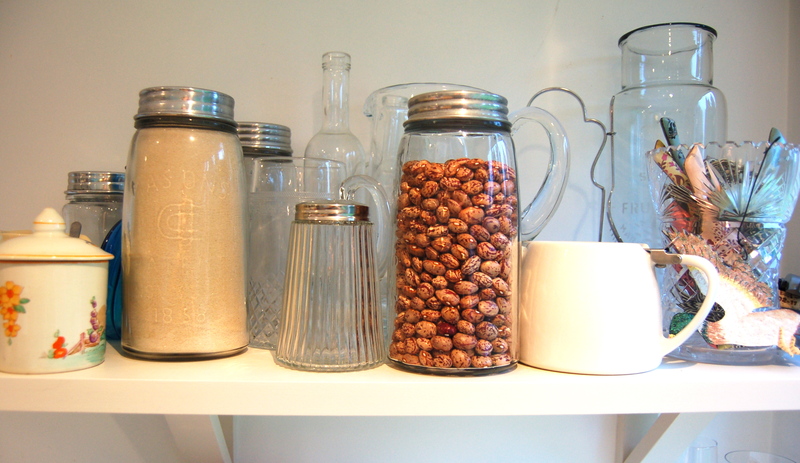 My only other criticism is they don’t stack which makes storing them over winter quite difficult. The other long cloche that I use are the ones above with corrugated plastic which are also widely available (sorry, I’m not sure who makes them). The problems here are that once the side pieces fall out (which happens to me all the time) it’s almost impossible to get them back in. These pieces have to go under the edges of the ridged plastic, which is a very tight fit (in order to stay in place I assume) but it means mostly removing the whole lot and putting it all back in again, hence all of mine in the garden now being open at the sides. It’s also fractionally harder to clean because of the ridges than the Haxnicks version and they don’t have a middle handle so I find them difficult to lift by myself without stepping on my raised bed. In addition to the long cloches I have quite a few of the plastic bell cloches also shown above, also from Haxnicks. The largest size have been a great investment, still in really good condition many years on and nicely heavy so you don’t have to pin them down in windy weather, sadly the slightly smaller lighter plastic ones are often used by the boys as space helmets and many have cracked. I’ve ordered a couple of metal ‘tent’ frames with both plastic and mesh covers so it will be interesting to see how good they are, more in that when they arrive. 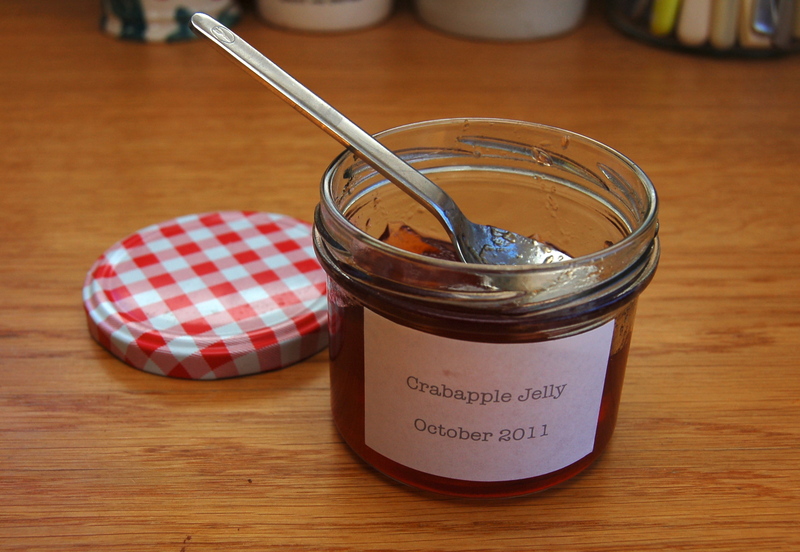 We’ve just eaten Sunday lunch, for which I cooked Delia Smith’s Bangers Braised in Cider and to follow Steamed Treacle Sponge and I was most excited to find that M and the boys declared the Crab Apple Jelly I made back in November a success. I am relieved, otherwise I did have a lot of jelly to eat all on my own, especially as there is also the Apple & Mint and Apple & Thyme versions to get through. At this point I should say (as I forgot last time) that I used this original jelly recipe to make the Crab Apple Jelly only omitting the herbs. My only making notes were that on first straining I didn’t get a lot of juice from the apples and despite being soft the skins didn’t all break to release their juice. I think it might be because I didn’t cut them in half before simmering but they were so small, like little cherries, plus rock hard and I didn’t bother. To fix this, instead of squashing the straining bag contents and causing the jelly to go cloudy I re-boiled the mush with some more water until completely broken down and then strained again. Despite loosing it’s pretty pinkness in the setting stage, it’s still a lovely colour. 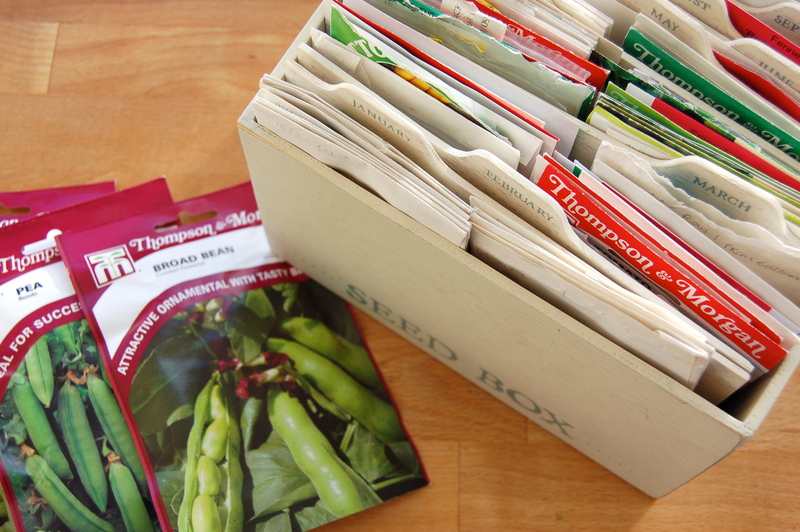 My seed boxes organised by the month - one of my best buys! We are heading to the end of half term and it’s been a bit of a mixed bag, starting with a lovely break in the Yorkshire Dales visiting family but turning to the usual scenario of ill children on our return. I say usual as it appears half of blog world is in the same boat, I swear colds, small children and holidays are somehow linked….that or we’re just unlucky. 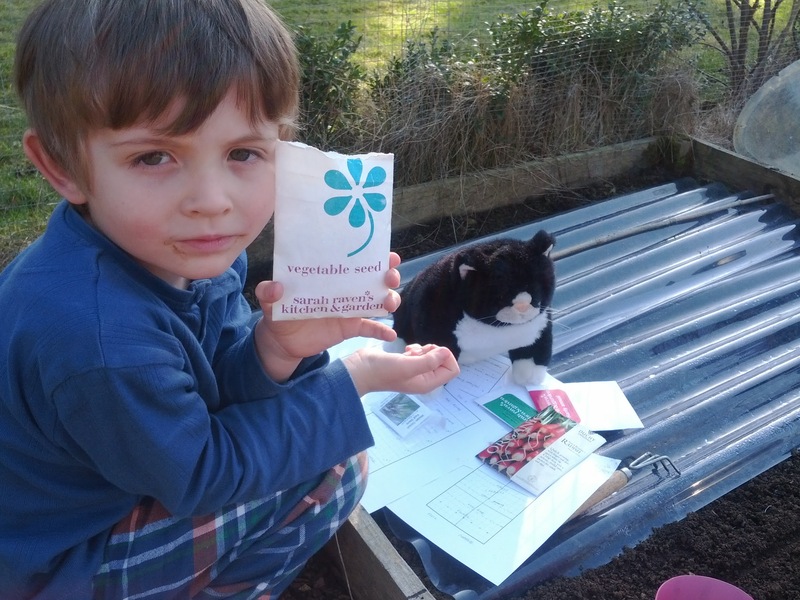 Still, as there has been quite a lot of sitting on sofas and mopping of brows it has provided a perfect opportunity to get my sowing lists organised for the next couple of months, as always I’m kicking off with tomatoes, aubergines, peppers and chillies. All the above will be started in small pots in the kitchen (where we have 2 walls of glass, so it’s the lightest room in the house) mostly with only a couple of seeds per pot, then covered in a plastic bag until a few green shoots appear. Following on from last year, I don’t plant anything in large quantities, we just don’t have the space and I really only want to grow what we can eat fresh with a bit for use in pickles etc. Because of this, I try not to sow many extra seeds, only what I hope to grow to the final vegetable as I am really bad at throwing away seedlings and in the past have found myself with a glut of produce as a result, there is nothing worse than growing tired of something you have taken the time to grow and even worse allowing it to rot away, without being picked. I’m itching to get outside and give the garden a good tidy, the recent snow has made a mess of the grass and as I never found time to cut back all the dead foliage in the borders they do look dreadful. 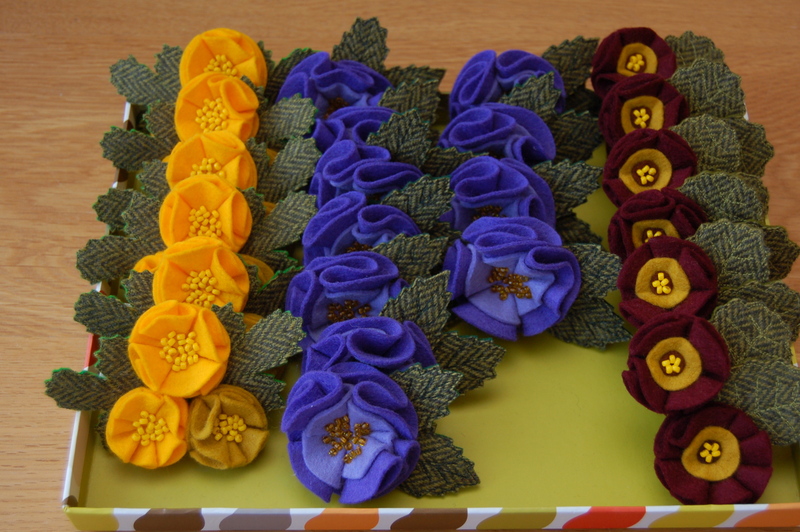 Sadly I have sewing commitments that are taking up a lot of my time (I’m stitching felt flowers as above at the moment) but I do hope to get my hands a little bit dirty next week, I know it sounds mean but roll on the boys being back to school. We are having a weekend at home, patiently waiting for ‘the snow’ (for those outside the UK, we have been issued with a weather warning that much of the country will be covered in snow by Sunday morning) to arrive and pottering about doing house jobs. I have cloched as much as I can in the garden, in anticipation of the colder weather, mostly the very advanced foliage of the anenomies and ranunculus in the cutting patch and a few of the clingers on from last year such as antirrhinum. I have finally moved all the kids toys into the greenhouse and shed, I figure if we are lucky enough to get some snow (and I suspect the boys may run a mutiny on the met office if we don’t get any) I might like to look out on a pristine garden and not one strewn with plastic toys and old abandoned scooters. Indoors the boys are still in their pj’s playing, M is tinkering with his bike and I am making marmalade. January to early February they are easily missed. Following on from last year’s marmalade making session, where I stocked up on whisky marmalade and Seville jelly, I decided to opt for a dark chunky version this year (I still have a few jars of the other kind in the cupboard). 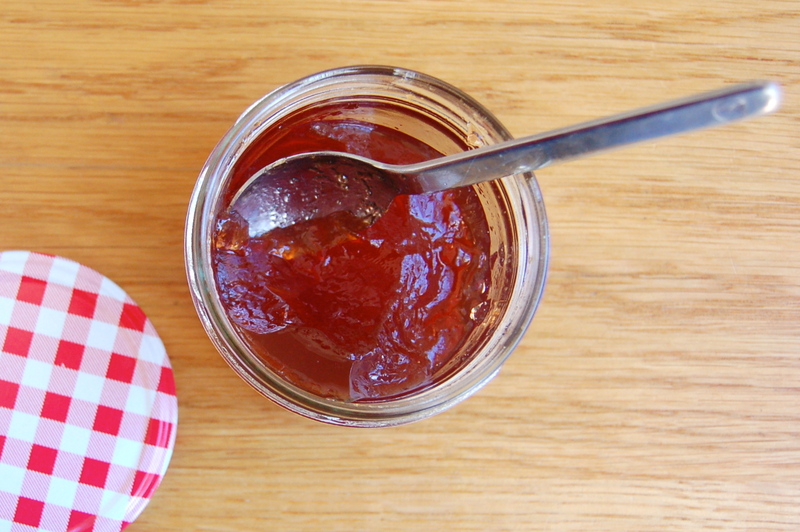 Although Seville jelly is made to a different method, really the only difference from whisky marmalade is subbing some of the preserving sugar with dark muscovado sugar, cutting the peel a little chunkier and shorter and, obviously, omitting the whisky. Looking at the sugar ready in a bowl makes my teeth ache. I didn’t have enough preserving today so used some golden granulated as well. Ream oranges and lemon into a double layer of muslin set over a sieve, scouring shells to get as much pith as possible (I used a clean but old tea towel as I have run out of muslin cloths, I also tend to scrape the shells out after reaming using my fingers to pull every last bit of flesh from them them). Discard shell of lemon. Slice orange shells into chunky batons. Add to pan, bring to boil then reduce and simmer, uncovered, for about 2 hours, until the rind is completely soft. Add sugar and stir over low heat until completely dissolved. Raise heat and rapid boil for a set (15 mins). Remove from the heat and test by putting a small amount on chilled plate (from the freezer), after cooling for a moment it should form a skin that wrinkles when pushed with finger, if this isn’t the case, boil for a further 5 mins and test again, repeat until set is achieved. Leave marmalade for 10 mins to cool before stirring (to distribute the peel) and potting in clean warm sterilized jars (I put my jars and lids into the oven for 10 mins at a medium heat), with wax discs on top. Cover with clean tea towel and leave until completely cold before putting the lids on. So the most important things, I find, are making sure the peel is properly soft at the first simmering stage, once you add the sugar it toughens up a bit and this can make for chewy bits of peel in your marmalade if it’s under cooked. 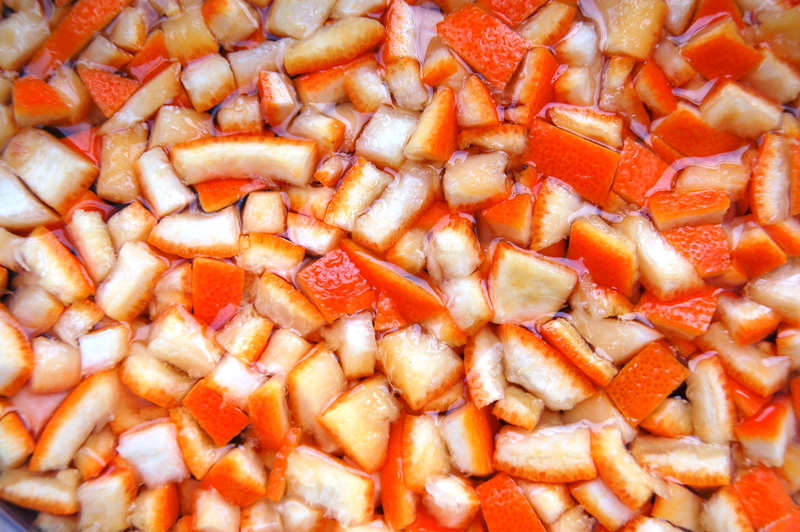 Another thing is being absolutely certain all the sugar crystals have dissolved before rapid boiling, otherwise the marmalade can crystallize in the jar. I tend to leave mine for a very long time over a very low heat after adding the sugar. The weather has turned colder here in Kent, sadly no snow as of yet which has confused the boys after last year’s flurries, but the frosty mornings have put me in the mood for stews and soups and I have been batch cooking and stocking up the freezer. We mostly have freshly cooked meals, but as I eat on my own in the evenings (M works late and eats there and the boys eat very early as they arrive home from school ravenous), sometimes I just fancy something tasty and re-heated with maybe some added fresh vegetables on the side and I’d much rather it’s something I’ve cooked from frozen than a ready meal. First up I made a batch of Jamie Oliver’s ‘Peposo/Hunters Stew’ which basically involves stewing 1.25 Kg beef, 10 whole peeled cloves of garlic (yes, 10! 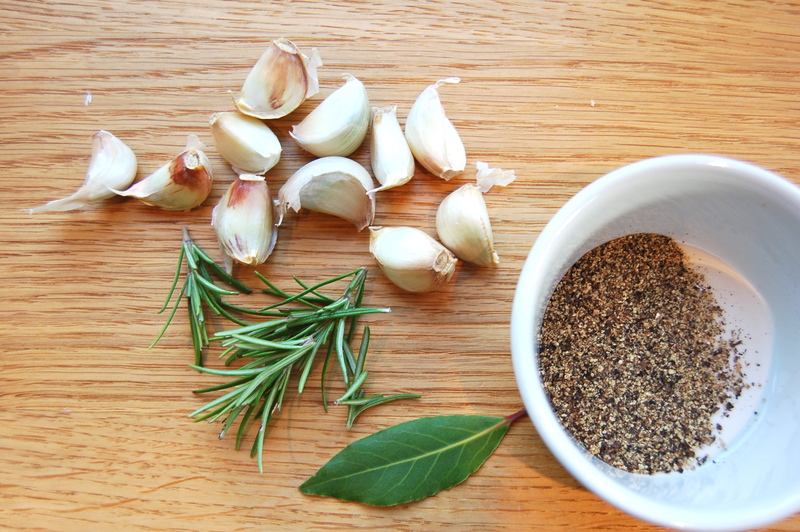 ), 2 tablespoons of freshly ground pepper (yep you read that right as well), 4 sprigs of rosemary and a bottle of Chianti all thrown in a pot, covered and cooked in a very low oven, for forever (about 8 hours in this case). You can find the full recipe in Jamie’s Italy book. I have a bit of a love of this dish, partly it’s the sheer peppery, garlicky, beefiness and also it’s because as a family we don’t eat much red meat, in fact M only eats fish so I do like to treat myself to it once in a while. The down side is it doesn’t go far, as the beef is the main ingredient and there are no vegetables to bulk out the stew, I always feel like there’s a lot of effort for not a great return. The other down side is attempting to hand grind 2 tablespoons of black pepper, my will to live left after about a tablespoon on this occasion so that was all I put in. The resulting stew is pretty amazing though, very intense and rich and a little goes a long way, so maybe worth the effort after all. The other dish I made for the freezer was a batch of Boston Beans but using the barlotti beans I’d grown in the garden instead of haricot. Back in autumn I left these on the vines to dry, moving them (just pulled directly out of the ground, in fact with the supports still attached) into the greenhouse when the weather looked like it might turn wet, then I ignored them for a few weeks until my Mum kindly stripped and podded them by which time they were very dry beans. Well done Mum. They look so pretty in the jar I was almost loathed not to use them but it was worth it. I have linked above to Hugh Fearnley-Whittingstall’s version of Boston Beans as it’s the nearest to the one I make, which in all honestly changes a little each time. The main thing I do differently is to cook the belly pork separately, this is partly because it freaks me out with all the fat that is released and it’s also so I can have some plain baked beans that M can eat. I also add tomato puree, in this case in the form of some of my own from the freezer made with tomatoes from the garden and I replace the pickling onions with shallots, also from the garden.